Here's a new one: What do lawyers and tax accountants have in common? They're both found and researched online! Here's new insight into where and how Australians research professional services—and how businesses can connect at each point in the journey. In partnership with market research firm TNS Australia, Google conducted research to better understand how Australians shop for professional services—in particular, small- to mid-sized legal services, as well as firms that provide tax and audit services. 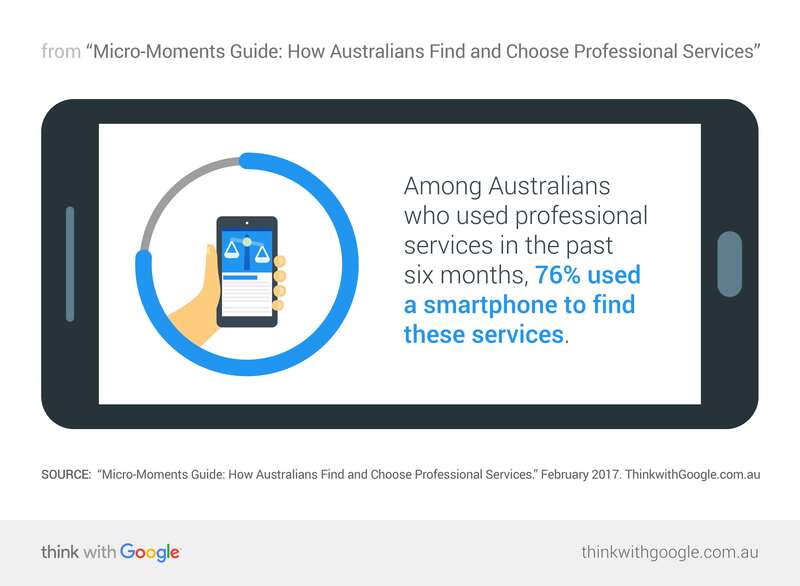 This is the latest installation in our micro-moments guide for Australian businesses and marketers. Using both quantitative and qualitative methods, we spent time with consumers to understand what they're looking for when they need professional services, how they make decisions, and where they go for information. Most people don't need to consult professional legal or accounting services often, so when a situation arises for which they need help, they start their searches by looking for general information. Half of the people we surveyed turn to their smartphones for immediate information or advice when triggered by an unexpected problem or situation.1 Consumers turn to the web to get educated on where they should start and what services they actually need. We found that consumers see taxes as more transactional and routine and legal as more personal, coming with some heightened anxiety. Consumers assume that legal will be a more prolonged process that will come with more face-to-face interactions. Be there: Mobile is people's go-to advisor, so make sure your business is present when consumers search for help. If you offer tax accounting services, for example, make sure to show up for general search terms such as "tax accountant," "tax refund," "personal tax return," and "income tax return." Provide useful content: You may know what your firm specialises in, but first-time customers probably don't. Different legal and tax scenarios will create different needs in the moment, so ensure that your site is clear and can help guide a newcomer through the process. Imagine someone who just got in a car accident, for example. If they think they might need legal advice, they probably want to quickly find out what information they should be gathering right then and there. Because consumers don't often know much about legal and tax firms, the benefits between businesses can blur in their minds. They turn to their smartphones to dig into what each business offers. 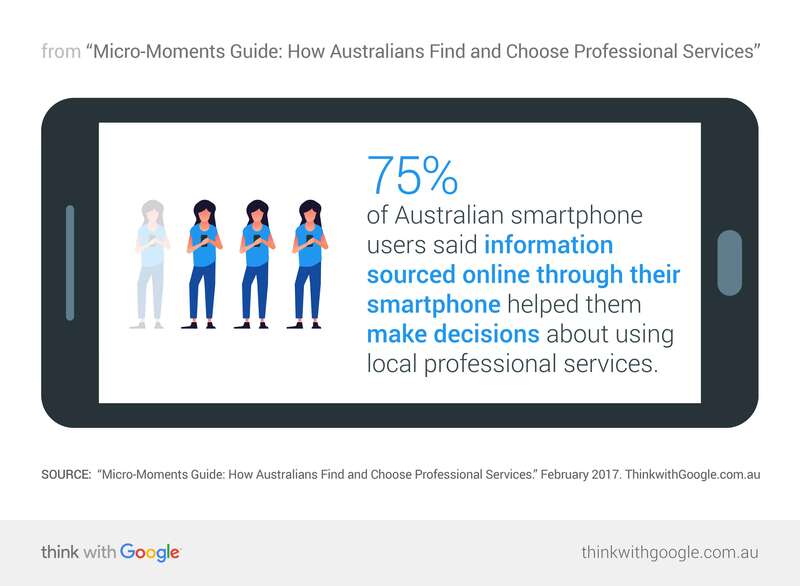 Among Australian smartphone users, 75% of Australian smartphone users said information sourced online through their smartphone helped them make decisions about using local professional services.1 They tend to choose a provider that feels right based on how the website communicates and what kind of differentiation they can spot in staff bios. Local convenience is paramount when consumers are looking for the firm that is just the right fit. Most consumers have an expectation of face-to-face contact with the law or tax firm that they select, so they need to be able to easily determine if your office is close to their home or work. They look for this info via mobile. Add reviews to your online business listing: To put it simply, reputation matters. Give consumers insight into the experience of using your business by including online reviews with your business listing. This will help consumers refine their choices and find a firm they can trust. Clearly communicate benefits on your mobile-optimised site: On your website and in ad copy, outline your businesses' benefits in basic language that makes your expertise evident. Consumers can get overwhelmed when researching a lot of different options, so make sure your site is easy to digest and interact with on mobile. Have a local presence: Consumers want convenient, close businesses, so make sure your that online business listing is updated, you're present for local search terms such as "accountants near me," and you have location extensions set up. All their research and searching gets real when consumers are ready to talk with your business. Talking on the phone adds the human element to the decision-making process and moves things along quickly. The Australians we spoke to said they're looking for advice: What steps should they be taking? What should they be thinking about? They want to hear your answers to do a gut check and see if they sound right. A lot of them see this as a "try before you buy" phone call. This phase in the path to a final decision is all about building relationships, and it's important to be readily available when people want to talk. 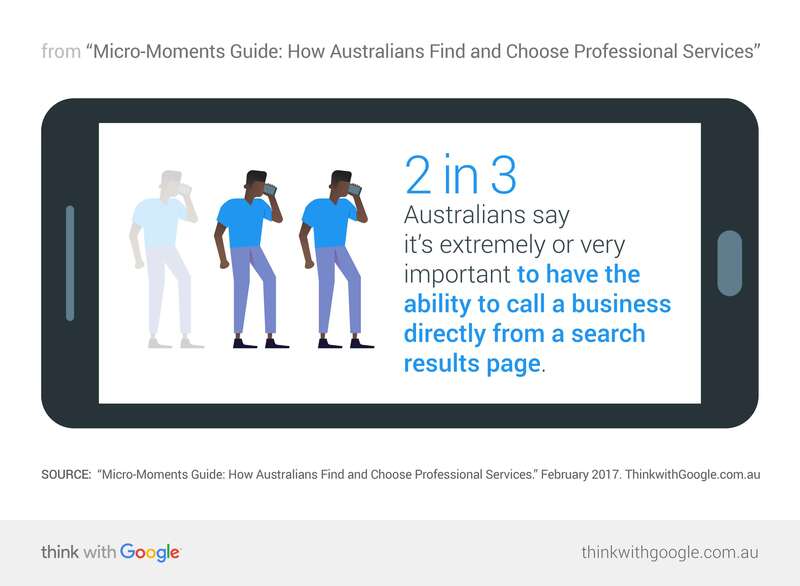 Two in three Australians say it's extremely or very important to have the ability to call a business directly from a search results page. Incorporate click-to-message ads: Australians are looking for information on mobile—and you can connect with them there. Click-to-message ads allow people to start a conversation with you right from their smartphones. This shortens their research process and allows them to feel comfortable with your business. When people want to talk to you, make it easy! Moving from researching to talking (and purchasing) should be simple and seamless. Enable people to reach you quickly. Consider click-to-call buttons and have mobile-friendly contact forms. When consumers are in a pinch and need your legal or accounting services, make it easy for them to choose you. Meet them where they are—on mobile—with seamless experiences designed around their needs. Helpful information, transparency, and easy ways to get in touch will help them. Make a case for them to hire your services. 1 Google/Galaxy, "Consumers in the Micro-Moment," June 2015, Australia, n=259 smartphone users.